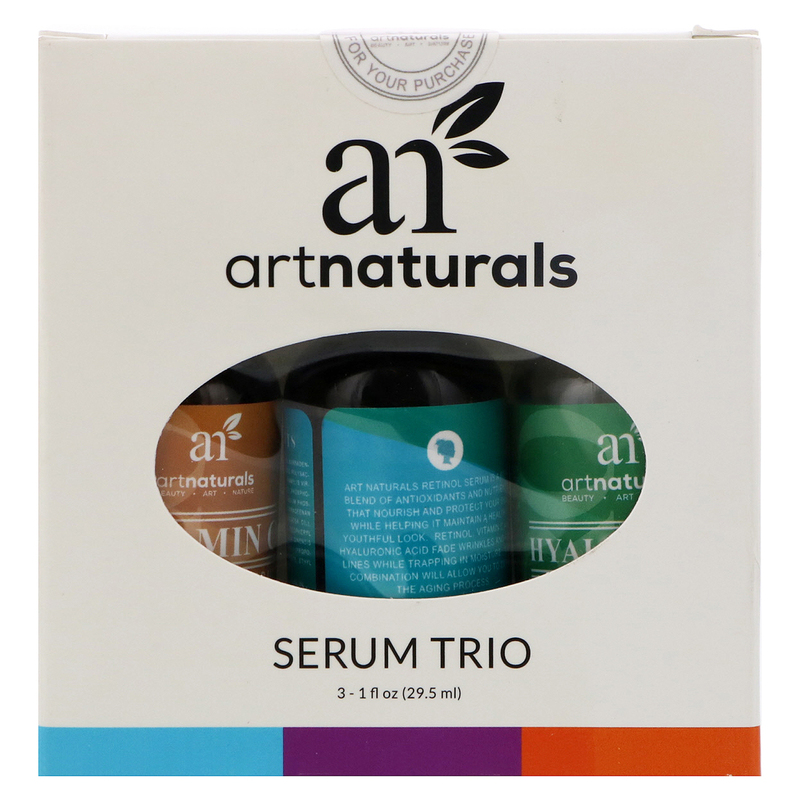 Triple the age-defying action with art naturals serum trio set. 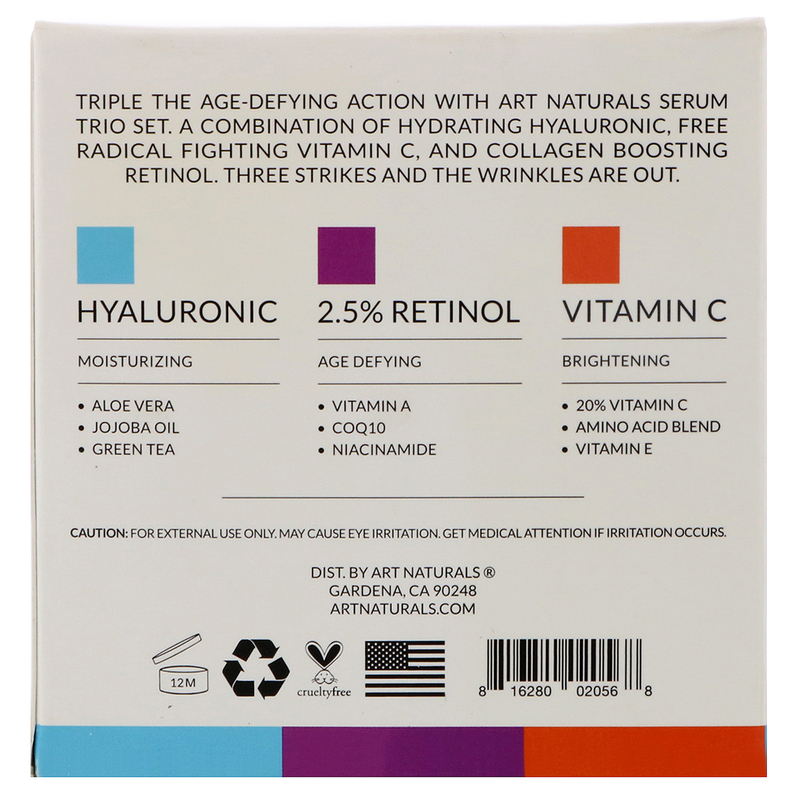 A combination of hydrating hyaluronic, free radical fighting Vitamin C, and collagen boosting retinol. Three strike and the wrinkles are out. Hyaluronic - Moisturizing Serum: Wash and pat skin dry. If you are going to use a toner, apply the toner before this serum. Apply a dime amount to entire face, neck and decollete. Allow to dry. Can be used daily. Can be used under make-up. Follow with your favorite moisturizers. 2.5% Retinol - Age Defying Serum: Wash and pat dry. Apply a dime size amount and massage into the face and neck. Allow to dry before applying makeup. Can be used morning and night on normal or oily skin. For sensitive skin use only at night. Follow with sunscreen. Vitamin C - Brightening Serum: Clean and pat skin dry. Apply a dime-size amount to the entire face, neck, and decollete. Allow serum to be absorbed. For best results, use once a day. Can be used under makeup. 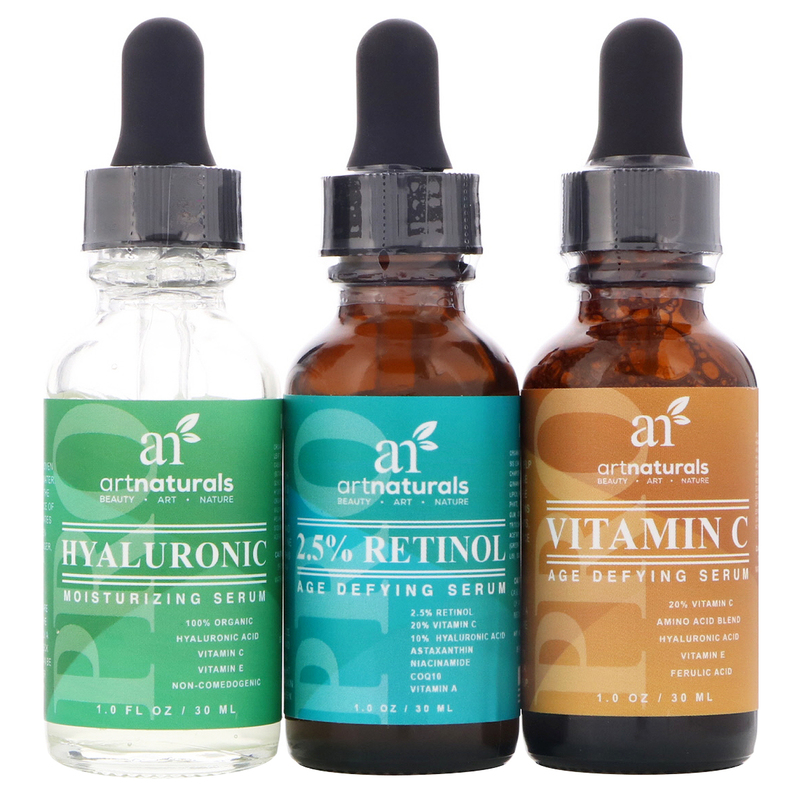 Hyaluronic - Moisturizing Serum: Organic herbal infusion, organic aloe barbadensis leaf (aloe), hamamelis virginiana (witch hazel), cassia angustifolia seed polysaccharide (botanical hyaluronic acid), kosher vegetable glycerin, methylsulfonylmethan (msm), hydroxyethyl cellulose, carrageenan gum, organic simmondsia, chinensis (jojoba oil), wildcrafted camellia sinensis (green tea) pelargonium gravolens (geranium essential oil), sodium ascorbyl phosphate (vitamin c), tocopheryl acetate (vitamin e), sodium benzoate, potassium sorbate, ethyl hexyl glycerin. 2.5% Retinol - Age Defying Serum: Organic herbal infusion, organic aloe barbadensis leaf (aloe), cassia angustifolia seed polysaccharide (botanical hyaluronic acid), hammelis virginiana (witch hazel), pentylene glycol, phospholipids, retinol, polussorbate 20, potassium phosphate, hydroxyethyl cellulose, carrageenan gum, organic simmondsia, chinensis (jojoba oil), triticum vulgore (wheat germ oil), tocopheryl acetate (vitamin c), organic camellia sinensis (green tea), wildcrafted resina propoli (propolis, sodium benzoate, potassium sorbate, ethyl hexyl glycerin. Vitamin C - Brightening Serum: Aqua (water), sodium ascorbyl phosphate (vitamin c), hamamelis virginiana water (witch hazel), cassia angustifolia seed polysaccharide (botanical hyaluronic acid), dimethyl sulfone (msm), tocopheryl acetate (vitamin e), aloe barbadensis leaf extract (organic aloe), ferulic acid, glycerin (kosher, vegetable), simmondsia chinensis oil (organic jojoba), centella asiatica extract (organic gotu kola), equisetum arvense extract (horsetail), taraxacum officinale extract (dandelion), geranium maculatum extract (wild geranium), sd alcohol 40b, (2s)-2-amino-5-guanidinopentanoic acid, acrylates/c10-30 alkyl acrylate crosspolymer, phenoxyethanol, ethylhexylglycerin. For external use only. May cause eye irritation. Get medical attention if irritation occurs.